I work personally and confidentially with every client at a reasonable flat fee quoted up front and will get you the same resolution and relief as high-cost tax attorneys one would find in Beverly Hills, Century City, or Downtown Los Angeles who charge $300–$1,000 per hour. More people live in Los Angeles county than 43 US states—about ten million people. This includes residents of Burbank, Glendale, Beverly Hills, Century City, City of Los Angeles Santa Monica and West Hollywood in the north to Long Beach, Hermosa Beach, and Torrance in the south to Pomona, Claremont and San Dimas in the east and El Segundo, Manhattan Beach, Torrance and Rancho Palos Verdes in the west. It is certain that several thousand LA residents (and millions more in the US) have IRS problems, such as tax levies, wage garnishments, property seizures, past due tax returns, unfiled taxes, and IRS tax audits. In addition, LA offers about 250,000 employment establishments. Many of them also need tax help with or tax levies removed by the FTB, BOE, and EDD. In addition to tax levies, tax liens, and wage garnishments, some cases are referred to the IRS criminal investigation division and can result in imprisonment. Sometimes an officer or agent of the IRS, FTB, BOE, or EDD will even visit your office or home. I specialize in tax resolution and am licensed by the federal government to represent you before the IRS in your tax defense, so that you can become compliant with the IRS. With around 250,000 businesses and organizations in Los Angeles, you may feel singled out, but it happens to small and large businesses alike throughout the county, state, and country. 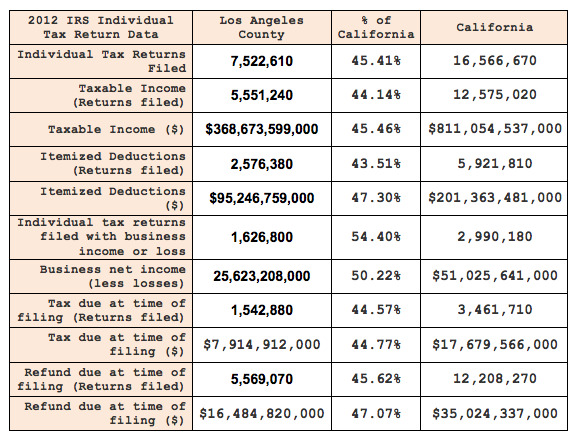 With almost $190 million dollars in payroll paid out to LA County employees, there’s a lot of possibilities for conflict with the IRS. Within 4,057 square miles Los Angeles county is home to a little over ten million people, with about 3,700,000 employees. This includes over 100 unincorporated areas, such as Universal City, Malibu Vista, Rowland Heights, Marina del Rey, Long Beach islands and Santa Catalina island. Educate yourself about the IRS tax resolution services available to you. Whether you have not yet filed your taxes or have a tax levy against your assets, one option for tax relief is the Offer in Compromise (OIC), which is available if you haven’t paid back taxes, penalties, or interest. An OIC is an agreement to settle your tax liabilities for less than the full amount owed. Don’t get ripped off by people who guarantee an Offer in Compromise acceptance for you. Speak to a licensed and experienced enrolled agent to find out if you qualify for an Offer in Compromise and what other tax help is available to you. Get help from a highly reputable, experienced, and licensed tax resolution specialist. I am an Enrolled Agent (EA) and have represented 2,000 taxpayers over the past 20 years before the IRS. Only CPAs, attorneys, and Enrolled Agents (EA) are allowed to talk to the IRS on your behalf, Enrolled Agents, however, are the only tax professionals who are licensed by the US government and who specialize in tax resolution. Your CPA or attorney may not know the IRS as well as I do. Remember that millions of people each year have unfiled tax returns, tax levies, and other tax problems, but that does not mean you can continue to not file. The sooner you file and resolve your IRS problems, the sooner your IRS fears, anxiety, and penalties will stop. 65% of Los Angeles County residents (or about 6.5 million people) are in the civilian labor force. That’s about the same percentage as all of California. I am a proud resident of the city of Whittier in the county of Los Angeles–originally named El Pueblo de Nuestra Senora Reina de Los Angeles Sobre el Rio Porciuncula (The Town of Our Lady, Queen of the Angels on the Porciuncula River.). LA (as we call it now) is the second largest county in area in the nation, which includes two islands: San Clemente (uninhabited and operated by the US Navy for training and rocket testing) and Santa Catalina (with about 4,000 residents and great scuba diving on a day trip). Larger in area than Rhode Island and Delaware combined, it was formed in 1850 when the state of California was formed. Los Angeles is not home to the happiest place on earth. Orange County claims that. But we do claim the wiles of Venice Beach, the fast action at Six Flags Magic Mountain, the quaint retreat of the Queen Mary harbored in Long Beach, and the mysterious La Brea Tar Pits, where sloths and mammoth bubble up. Los Angeles includes some stunning and humble beaches (from Malibu in the north to Long Beach in the south), the San Gabriel Mountains, San Fernando Valley, and the high desert of the Antelope Valley and Palmdale-Lancaster. We have national and state forests, and even caves in the Santa Monica Mountains and Griffith Park. Within our 4,000 square miles, Los Angeles has almost every kind of terrain you would like to hike up or drive through or just pull off the side of the road and meditate on—not to mention entertainment. My office is in the southern part of the county, easy to reach via the 5, 605, and 60 freeways. 2SOI Tax Stats - Delinquent Collection Activities - IRS Data Book Table 16 – Delinquent Collection Activities, Fiscal Years 2013 and 2014, accessed May 12, 2015. 6SOI Tax Stats - Individual Income Tax Statistics - 2012 ZIP Code Data taken from IRS, Statistics of Income Division, Individual Master File System, updated July 2014, accessed May 12, 2015.